Nursery Rhymes and Fun Times: Timberdoodle Giveaway! 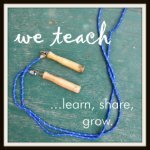 Psst: Timberdoodle is giving away one item of your choice for free from their preschool curriculum. Go over here to see what items are included! I love looking through their catalog!